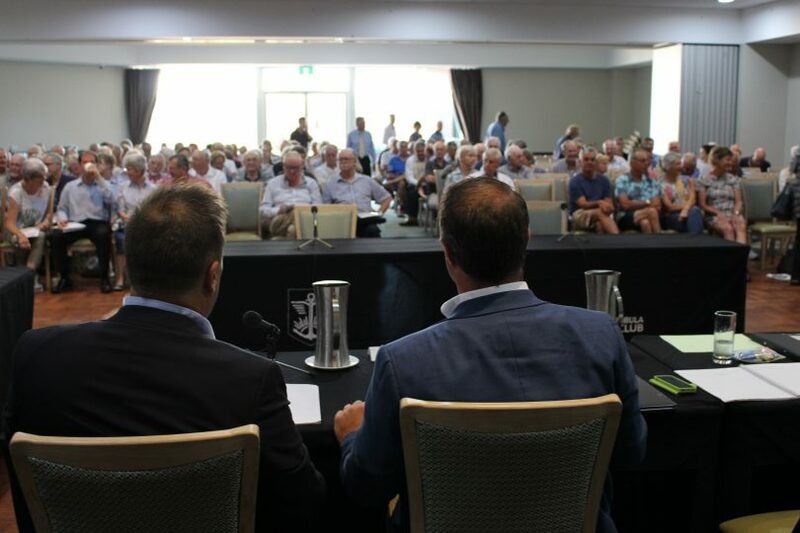 Jason Falinski MP (Liberal) and Committee Chair, Tim Wilson MP (Liberal) face a growing crowd at Merimbula RSL. Photo: Ian Campbell. The Commonwealth Parliament of Australia came to Merimbula yesterday (February 4) canvassing the impacts of Bill Shorten’s plan to remove refundable franking credits for self-funded retirees if he is elected Prime Minister. Not a self-funded retiree? This is still relevant. 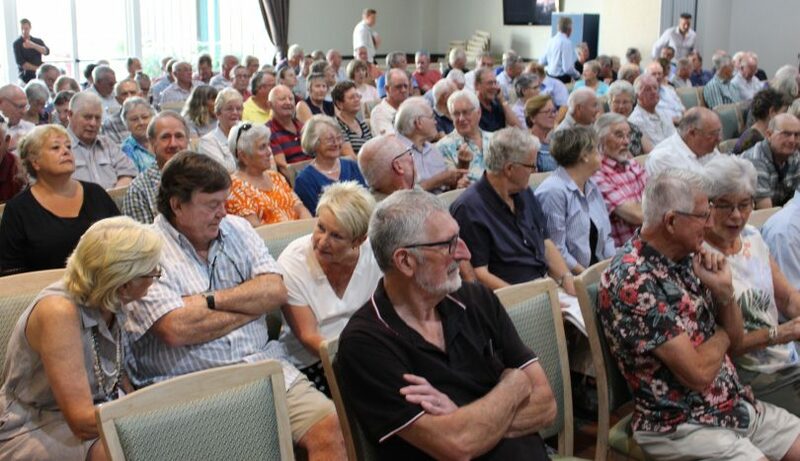 Around 250 people filed into Merimbula RSL to observe or take part in the public hearing at the invitation of the House of Representatives Standing Committee on Economics. Aside from local media, the event also attracted the national Murdoch press and was broadcast via parliamentary radio. This was the only regional public hearing held in New South Wales. Around 250 people turned out to witness the House of Representatives Standing Committee on Economics. Photo: Ian Campbell. Twenty-one people took up the opportunity to address the three MPs representing the committee during the 90-minute session. Speakers came from Nimmitabel, Wapengo, Tathra, Tura Beach, Wallagoot, and Pambula, all retired or working towards retirement. Nineteen of the twenty-one speakers gave a resounding thumbs down to the Shorten policy, cheered on by a supportive room. Only two people, also retirees, spoke to the drivers behind the Labor plan, that being more money for better health and education services while managing the increasingly ageing population. That is where there is relevance beyond those represented at the RSL yesterday. How is Australia going to deal with the challenges of an ageing population especially in light of the increasing need for health care that comes with that? Labor believes killing off franking credits needs to be part of that. Largely, the local testimony dealt with more immediate and personal issues for self-funded retirees and their families. But first – franking credits: what are they? Put (I hope) simply, franking credits spare shareholders in a company from paying tax on their share of that company’s profits, because the company itself has already paid tax on those profits. The shareholder, who in this case is also a self-funded retiree, receives credit and gets that back as cash in the same way as an ordinary Pay As You Go taxpayer does if she or he pays too much tax in the year. It stops tax being paid twice on effectively the same money. The origins of the system are in 1987 when Paul Keating was Treasurer. The Howard Government made further changes in 2000 and 2002. The Commonwealth Parliament of Australia came to Merimbula canvassing the impacts of Bill Shorten’s plan to remove refundable franking credits for self-funded retirees. Photo: Ian Campbell. Fairness was a theme that ran through all of the testimony collected by Hansard in Merimbula yesterday. Men and women who planned for their retirement with one set of rules are anxious that a change in government later this year will impact on the money they use day to day, for little extras, or that they leave for their children as an inheritance. “Under Labor’s proposal my wife’s taxable income would be reduced by 25 per cent to $18,550, this is not a fair go,” says John Esk. “I have an income of around $50,000, that does not put me in the wealthy, rich category, we can live comfortably,” says Bayden Cameron. “At our stage of life, my wife and I have no ability to adjust our investment decisions, to replace the projected loss of income,” says Chris Young. “I consulted my accountant last week, I said – Scott what will this cost me? He estimated about a grand a month,” says Chris Sparks. Twenty-one people spoke for around three minutes each. Photo: Ian Campbell. Offering a wider view of the impacts, Gary Skelton from Kothes Chartered Accountants spoke of the 370 self-managed super funds his firm assists across the Bega Valley and Snowy Monaro. “Our clients use these franking credits as part of their annual income – to live. No other sections of the community are proposed to have their annual income slashed – it’s just unfair,” he says. The Liberal candidate for Eden-Monaro Fiona Kotvojs labels the change a ‘Retiree Tax’. “This will undo investment plans for about 7000 locals who worked hard to be self-reliant in their retirement,” she says. “When retirees get a refund on share dividends it is because the tax has already been paid by the company. “Labor’s Retiree Tax would change the goal posts and lead to more people relying on the Age Pension in this electorate,” Dr Kotvojs says. Labor’s Mike Kelly, the sitting member for Eden-Monaro has labelled the Merimbula public hearing as nothing more than a scare campaign and an abuse of parliamentary processes. “If we are going to increase our investment in important public services in a fiscally prudent way, we have to recognise that many of the tax concessions that some people have used as an entitlement are no longer sustainable and need to be reformed,” Dr Kelly says. Deputy Chair, Matt Thistlethwaite MP (Labor) Inquiry Secretary, Dr John White, Chair, Tim Wilson MP (Liberal) and Jason Falinski MP (Liberal) Photo: Ian Campbell. Some speakers in Merimbula did point to changes Labor could make to respond to the concerns. Mr Shorten has rejected any softening of the policy he’s taking to the election. “To put it directly – do people want a government or a piece of plasticine?” he said on Insiders. The concerns expressed by individuals in Merimbula are real and justified. What was missing is the bigger discussion that seems to be happening on the sidelines about an ageing Australia and reform to the tax system. Perhaps we’ll see that the next time parliament visits. Written submissions to the inquiry are still being taken. More information is available via the Committee’s website. I think Labor is missing two critical points. First, it claims to be hitting the wealthy - talking about the volume of refunds allegedly going to retirees with over $2.4 million, but it ignores the fact that these retirees DO pay tax. Labor has not factored the changes resulting from the Transfer Balance Cap legislation, which now creates a scenario where those with larger superannuation balances will retain their franking credit benefit as a tax offset, while those with smaller balances will lose income needed to stay of the aged pension. Secondly, Labor says self-funded retirees pay no tax, but ignores the fact that they save the government tens of thousand per year by being self-funded, and they pay more for health, pharmaceuticals, council rates, electricity, car registration, etc. and forfeit a host of other benefits - the provision of which imposes cost on the community. If these people are forced to quickly drain their savings and revert to the aged pension because their income has been cut too drastically, the savings Labor claims quickly evaporate. Already, I am hearing soon-to-be-retirees stating that they are running their savings down to ensure they don't exceed pension asset thresholds. Due to the lowering of the assets threshold, it's already questionable whether extra savings have any value to the saver if their assets are not well in excess of $1 million (for a couple). If Labor succeed in implementing their policy, hundreds of thousands are likely to recognize that extra savings simply benefit the taxpayer and not the saver, and elect to reduce their assets to qualify for a part pension. Other affected parties may move to higher risk investments to try to make up the losses, with potential to suffer loss that will make them heavily dependent on the taxpayer. To the extent that some retirees may simply shift assets to avoid impact or may reduce their spending, Labor either loses the benefit or, worse, risks slowed business profits with resulting GST revenue reduction and flow-on reduced job losses and income tax as a result of reduced spending. This proposal makes no sense to me. It does NOT recognize the real and very substantial contribution of self-funded retirees to the economy. It is grossly unfair in that it taxes dividends differently from other income, and it discriminates against retirees based on an artificial test of means that favours those who plunge a large portion of their wealth into the family home. It is even so unfair as to declare that a person with far less wealth, due to owning a modest home, but just $1000 more assessable assets should lose a benefit for life that the person with $1000 less assessable wealth but potentially hundreds of thousands more total assets enjoys. It's a highly discriminatory and unfair imposition on less well-off retirees while the proportional cost of supporting a pensioner potentially rises and the wealthy continue to cost the nation some $54 billion in tax credits. Ian - your paragraph “The concerns expressed by individuals in Merimbula are real and justified. What was missing is the bigger discussion that seems to be happening on the sidelines about an ageing Australia and reform to the tax system. Perhaps we’ll see that the next time parliament visits.”... is spot on... that this is not happening & that there are not enquires (of this type) being held into (for example) broadening the tax base shows this to be an election beat up (narrow enquiry into an opposition policy) by the party in power sets a bad precedent... Wilson’s, his relative’s & the so called ‘grass roots’ campaigners actions - self interest bordering on corruption only confirm that impression. This meeting at Merimbula is blatant Liberal party electioneering! Why are humans so self interested and focus on the small picture? Couldn't agree with you more, Julie King! plus we paid plenty of tax during our long working life. What other incentives do self funded retirees get - cause I would love to know about those. I am not poor but definitely not in the "well off" bracket either. We never got super as we were self employed all our life, so those franking credits certainly help with our modest yearly income as the low interest rate on a small deposit doesnt give us a comfortable retirement. We cant afford to holiday every year but friends on pensions seem to find the money to do so?? Sadly Labor's policy to hit on retirees seems grossly unfair and hitting a sector that should be getting a bit of a break as we aren't costing the Government a penny. Remember "Self funded" retirees - not aged pensioners getting Government money. Leave our franking credits alone! Why dont self funded retirees deserve a "pat on the back" for not being a burden on the country and its finances. We dont get free medical, free travel or free anything nor do we ask for any money from the Government and all this through hard work and paying our taxes during our working life. Now Labor wants to take the little we do get back via franking credits away from us. If we all end up on aged pensions then, how does this help Australia's budget and looking after the growing ageing population. We can't survive on 1-2% bank interest and that after living through the Labor Governments 18% mortgage interest during the 90s. It will be a sad retirement for a lot of hardworking Australians if Labor gets into power this year. I am a self-funded retiree. I don't believe people should receive a tax refund when they have not paid tax. It is as simple as that. By all means, use dividend imputation to reduce tax due but when the tax due reaches zero - that's it. There are already more generous tax arrangements for older Australians (like me) that reduce their tax liability compared to other Australians. But what is the logic to give a tax refund to someone that hasn't paid tax? If you are not paying tax on your dividends in the first place due to tax thresholds - giving a refund changes the process from eliminating double taxation to applying negative taxation. Taking from the working poor to give to the better off. I am a retired self managed super fund. Yes we need to have policy in place for the many people who will need health care, age care and housing but robbing retires that have worked all their lives is in my eye's theft. And every time Labor is in power the country finance is run empty.They just do not understand Small business are the back bone of the country. Labor greed and as none of them have every run a small business do not know the hours put in or understand the operating of such business to then be tax more not understanding they are what make the country rich. Will all self funded retired super funded people end up on the pension.? They will And that will cripple the country. We need younger people running the country NOT the same old Same Old boring man.Could we please have a referendum on immigration the money spent on housing , schooling and health could be spent on the people of Australia that worked all their life that made Australia what it is. Fully agree - we are also self funded pensioners and will be impacted - your point is well made. This government is corrupt root and branch and has to go.